Dawn Chorus CDs Now On Sale! 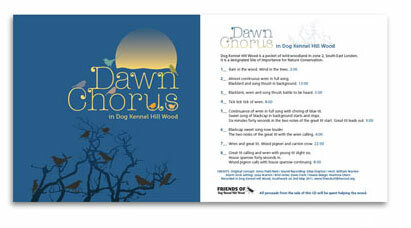 The recording of the Dawn Chorus in Dog Kennel Hill Wood is now available to buy on CD for only £5. Many thanks to Mariona Otero for the lovely cover design and for organising the printing. The CD contains over an hour of continuous bird song, recorded in the wood in May 2011. There are notes inside the cover to explain which birds are singing when. Thanks to Dave Clark for these notes. All proceeds from the sale of the CD will be put back into the Friends of DKH Wood and used to help the wood in some way e.g. native bulb planting, litter sacks, promotion of the wood etc. Please get in touch if you would like to buy one.